A “city” visit with our son and daughter-in-law in Australia is causing us to take a few more clothes on this trip than we would if we were just going on a scuba diving only trip. Add a present or two for the displaced Canadians, and we decide to forego the “carry on only” rule of travel. 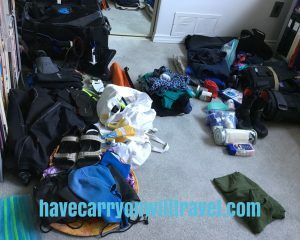 As we start to pile dive gear, clothes and all that other stuff that goes with traveling, we discuss luggage and decide to use my somewhat larger carry on wheeled bag and an old bag from Murray’s mom that is a regular sized wheeled suitcase. We do a test pack early on and it looks like these two bags will work. The piles on the floor, unfortunately, get bigger the closer to departure date we get. Last Thursday, I have an itch to do the final pack. I empty the bags and slowly pack them again, filling in all the small crevices. The bags are pretty much full and there are still items on the floor. I call Murray for a consultation and we decide to weigh the bags. The large bag comes in at 37 lbs, the small one at 30 lbs. We are in trouble. Why are we in trouble? We are flying on two small airlines, one in Fiji and one in the Solomon Islands. The weight limit for checked bags on the one is 33 lbs and the other is 35 lbs. and we have heard that Fiji Airways is very picky about weight limits. So, we are in trouble. Okay, now what? I decide to sort the items into “what MUST go” (dive gear) and “what could be left behind” (clothes!) so I expand the mess into the living room. I get most stuff out of the big suitcase and suddenly decide to weigh the suitcase. On our scale, it weighs almost 10 lbs! Yikes! We are using up valuable weigh limit room for the suitcase!!! Onto the web I go to see if I can find a wheeled suitcase that is lighter than 10 lbs. Nope. They all weigh between 8 and 10 lbs and the cost of a new suitcase for a couple of pounds isn’t good enough. Wait a minute! What about a duffel bag? BINGO! Now Murray gets into the hunt too. We find a Thule duffel bag that weighs around 4 pounds, which will give us about 6 lbs of weight, and will give us an extra 10 litres of volume. Unfortunately, we cannot find one in Edmonton, so we take a deep breath and order it on Amazon Prime to get it shipped within 2 days which will hopefully be tomorrow, Easter Monday. We are holding our breath until the duffel arrives. This entry was posted in Packing and tagged carry on luggage, packing, trip planning. Bookmark the permalink.